The coins are constructed of collected forms of visible and invisible light. In RGB value; red, green, and blue, are combined to create different color coins on a computer monitor or television screen, and used as currency and treasure. To play along, pick 3 numbers between -206,265 and 206,265; and pick a color, any color except black, to be your game piece(your communication core). Combined the 3 numbers represent a coordinate (X,Y,Z) in a 3 dimensional game area for your Communication Core in space. (above) 7 colored crystals exist in the Jade Red and Cannonball Head system. One crystal exists in each zone, except the zone measuring positive (x, y, z). The size of your colored communication cores are 1 unit. The size of the colored crystals are 20x20X20 units (occupying 8,000 units). (above) Your Communication Core carries a small drone a 1/4 the size of your Communication Core. You can use your drone to explore while keeping your Communication Core coordinate in space. You can send your drone to specific coordinates, or you can send it out a desired distance along an X,Y, or Z axis. The drone can collect items, and will send an image to you of nearby objects, your space station will also send images. The drone adds another chance of Jade Red and Cannonball Head locating you in space. You can only move your Communication Core while it is carrying your drone. Here is an image of how your Communication Core station makes use of the ghost coordinate feature. 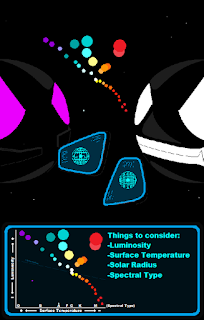 The blue sphere on the left has moved over one unit(a unit being the size of the sphere), leaving the ghost coordinate in the previous location. This ghost coordinate adds an extra chance of Jade Red and Cannonball Head teleporting to you after you have chosen a new location. The ghost coordinate stays active for one new move of Jade Red and Cannonball Head. This is the Jade Red and Cannonball Head headquarters game area. The game area is within a 3060x3060x3060 unit section of the walls of the cloud formed by the center star galaxy. The cube at the top of the image in the distance is the Jade Red and Cannonball Head headquarters. All coordinates are calculated from the Jade Red and Cannonball Head headquarters located at (0, 0, 0). The top of the game area is not viewable in this image (above). There is an X, Y, and Z axis. Each axis has measurements from -206,265 to 206,265. Movements along the positive Z axis are movements toward dark outer space. Movement in the negative Y direction are movements toward the bright start galaxy at the bottom of the game area. Movements along the negative (left side of image) and positive (right side of image) X axis are movements toward the sides of the cloud. This image is viewed from far along the negative Z axis towards the back of the cloud. Coordinates along the positive Y axis will move you toward the top of the cloud.